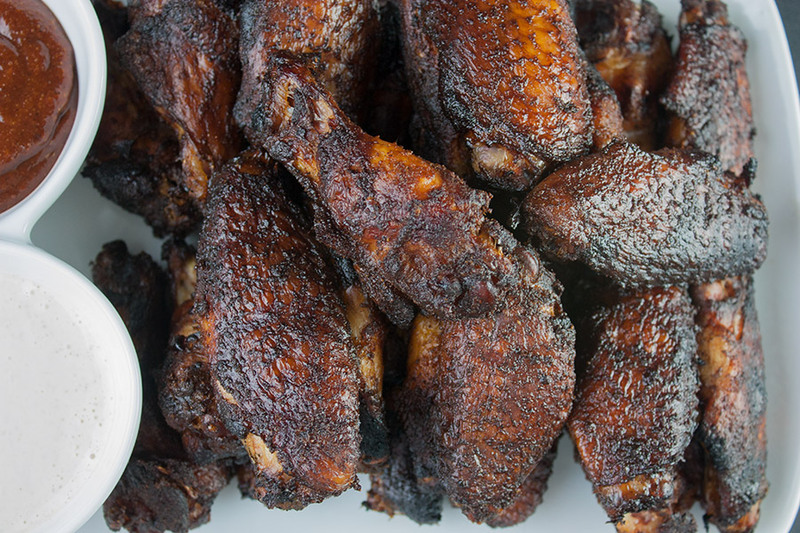 Smoked chicken wings … really? Yes. Heartedly YES! Emphatically YES! One of the first and most basic secrets about delicious chicken wings is that you can, indeed, smoke them. Most people will either fry or bake their chicken wings and they, more often than not, are good. There is nothing wrong with a plate full of fried up wings. 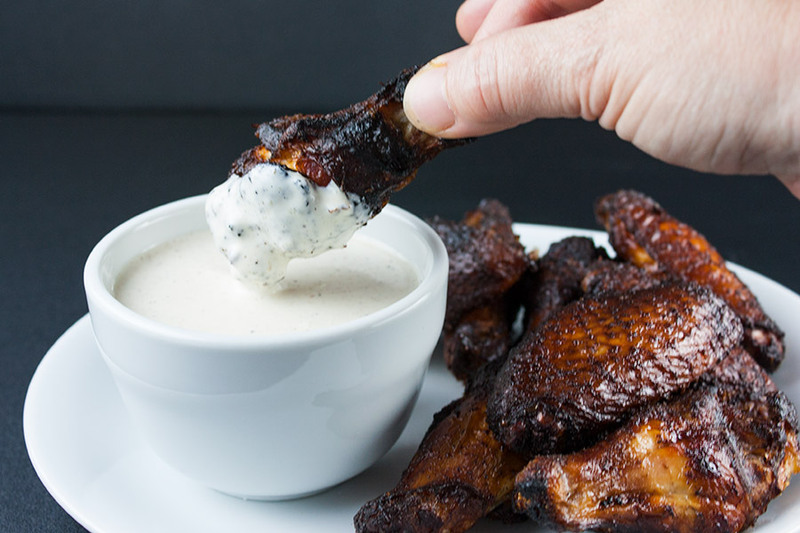 But if you’re interested in an entirely new flavor profile to your wings, if you want to blow away your guests at the next get-together at your house, please read on. I guarantee that if you follow these very basic steps, you will amaze them and they will clamor for more. It’s so easy, it’s like magic. The first thing you want to do is prepare your wings and rub. We usually buy our wings whole so we separate the wing, drumette, and tip by cutting them between the joints. We toss the tips and pat down the drumettes and wings, removing the moisture and put the wings in a large mixing bowl or zip lock bag. Mix the dry ingredients together in a bowl then pour the oil over the wings. Mix it around to coat all the wings. Next, pour some of your rub over the wings and mix it around. Keep adding and moving the wings around so they are equally coated with the rub. Once complete, set them aside in the fridge for a few hours, one hour at the least. This particular recipe calls for pecan wood for the smoke, but I know that hickory will do well too. You can decide to use any kind of wood that you like but know your flavor profiles. If this is your first time, I would recommend running up to Lowe’s or Home Depot and picking up some pecan wood. It is a milder smoke than hickory. If you do you use hickory, I would only smoke the wings for about an hour then just finish them up without smoke as it’s profile is much stronger. 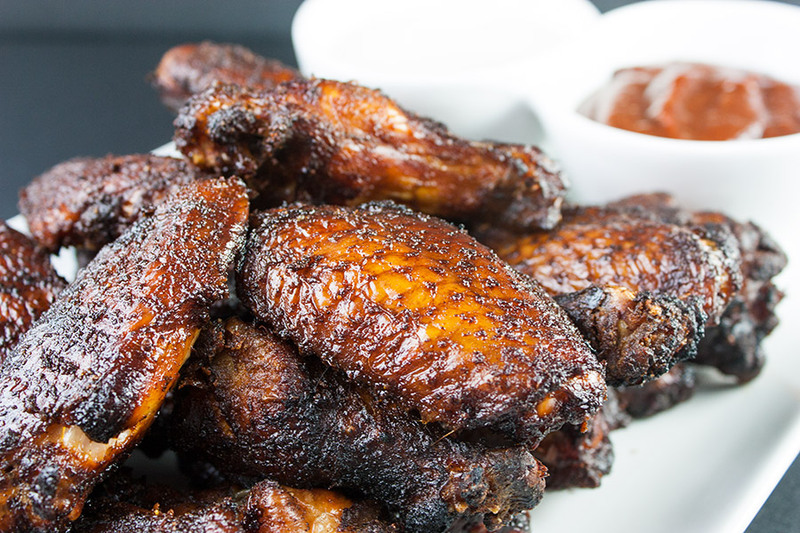 You can use a charcoal or gas grill with indirect heat, or a smoker to make these wings. You will need to get your cooker, whichever you’re going to use, to a temperature of 225-250 F.
If using a charcoal grill, push all your coals to one side, or along the edges as you want your wings to cook on indirect heat, not directly over the coals. Once you get your cooker to temperature, place your wings on the grill, toss in your wood chips and close it up. Keep an eye on your grill temperature, keeping it between 225 and 250 degrees F.
You also want to make sure that smoke is pouring out at your desired level. I smoke the wings for a full two hours. Doesn’t that look amazing? Smoked chicken wings just like that! After 2 1/2 hours, the wings are ready. If you want to make sure, use a meat thermometer and cook your wings to an internal temperature of 165 degrees Fahrenheit. The wings will be cooked, but we like ours with some char and really crispy so we put them over high heat for about 5 minutes each side to get them really crispy. Once done, pull them from the grill and let them rest for a few minutes on any baking pan or cutting board. At this point, you can apply a sauce if desired. Just toss them in a small bowl and add your favorite sauce and give them a toss to apply evenly. I urge you to eat a smoked wing BEFORE adding the sauce. You may find that you just want to eat them plain. This is because they’re amazingly good with just the smoke. 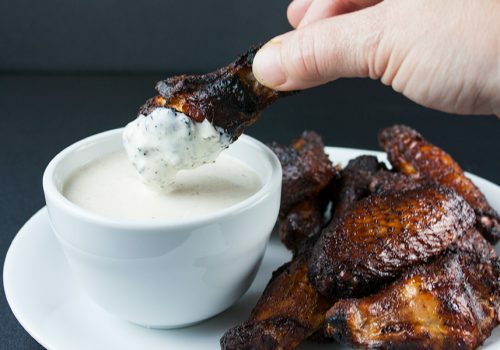 If you want to put the proverbial cherry on the top with these smoked chicken wings, you need to make up a batch of Alabama White BBQ Sauce for these. 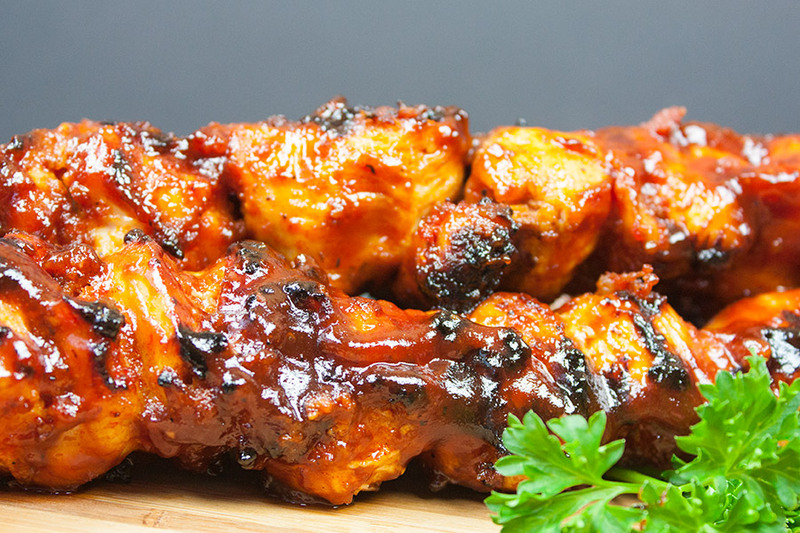 Of course, they will be the bomb with a favorite wing hot sauce or barbecue sauce of your choice. The sauce pairs so well with these wings. Something about a slightly vinegary peppery sauce with the smoke of the wings that makes it all come together to form a perfect ‘whole’. Making the sauce is a breeze, check it out here. We love wings at our house. We love them this way and that way. Baked, fried, smoked … it doesn’t matter. I will say, without reservation, that this is the most surprisingly delicious. I will make this recipe 2-3 times more than the standard baking or frying method. 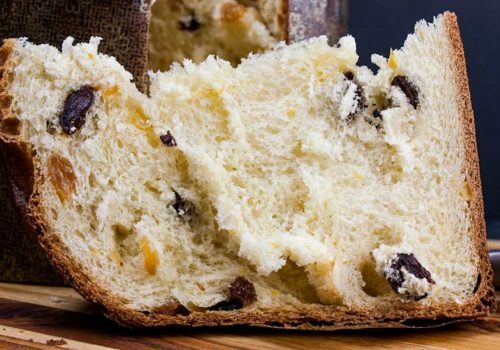 We hope that you give this recipe a go, and we would love to hear from you to see what you think. Thanks, and happy smoking! 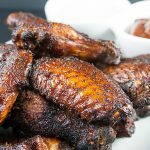 All the Secrets to making amazingly delicious smoked chicken wings with step by step instructions. These will be a smashing success at any kind of get-together. MUST TRY! Separate wings into drumettes and wings, if necessary. Combine spices to form the rub. 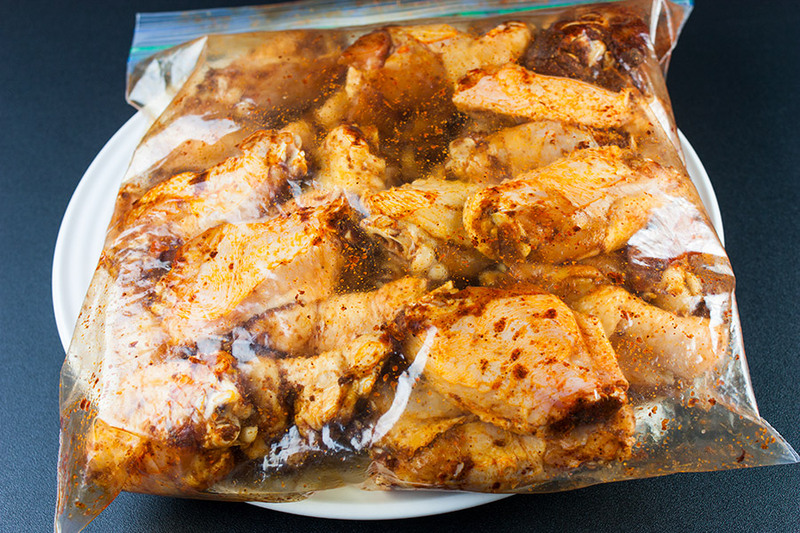 Place wings in a container, add and mix rub and olive oil over chicken. Let wings rest for at least an hour. Heat the smoker or grill to a temperature between 225-250 F.
Place wings over indirect heat. Add wood for the smoke to coals. Smoke for 2 to 2 1/2 hours, maintaining a constant smoke for at least 1 1/2 hours, the chicken should have an internal temperature of 160. Place directly over coals to crisp, approximately 5 minutes each side. Remove from heat and let rest for approximately 10 minutes. I have made this recipe once before and didn’t read the whole thing and didn’t grill them at the end. So they were not crunchy, the texture wasn’t so great but they were delicious. I am making it today for a potluck end of summer pool party and I’m getting it right this time! Awesome, Senita! Let us know how they turn out the second time around. what is the ingredient “fresh” on the grilled smoked chicken wings? Sorry about that, Debi! It was just an error, corrected now. Thank you so much for bringing it to our attention. What king of smoker do you recommend? Wow .. that is a question! If you’re only planning on SMOKING, I would recommend a cylinder style smoker. They’re very affordable and do exactly what it’s designed to do: smoke the meat. I personally use an offset firebox style smoker. This gives me the versatility of being able to grill AND smoke. I have also used my Weber to smoke by setting my charcoal to one side. This is good for when you’re smoking a very small amount of food that cooks rather quickly, such as poultry. In the end, it rather boils down to getting good at what you have. I use my offset firebox and use charcoal, but you can also use a standard grill that runs off of gas (with a wood chip box). Here is a link explaining different types, but in answer to your question “What do I recommend?” Use Charcoal … run away from gas. Ugly drum smoker is the way to go. You may be able to find one for sale but most people build them. Tried it. Perfect recipe to follow. We just bought a kamado and this was the first thing we tried. The smoking and grilling worked perfectly. But the rub was WAY to spicy for our taste. Thats way its only a 3 star. Try red oak. Pecan is also great but red oak is awesome imo. Delicious, I gone try it..
G’day mate! It IS in Fahrenheit, not Celsius. Thanks for pointing that out, I will fix the post to indicate which. First time I’ve smoked wings. Awesome recipe! The wings were a little spicy for my 4 year old, but he still polished off 5 of them. I may reduce cayenne for people who can’t handle the spice as much, but keep it the same for my batch. I will make them again. Thanks! Thanks, Danny! Glad you liked them. I was really surprised myself the first time I made them. Awesome that your progeny killed off 5 of em!! That’s a healthy portion for a 4-year-old. 🙂 Yeah, cut back on the cayenne to reduce the spiciness for those that are sensitive, it’s always a safe bet. 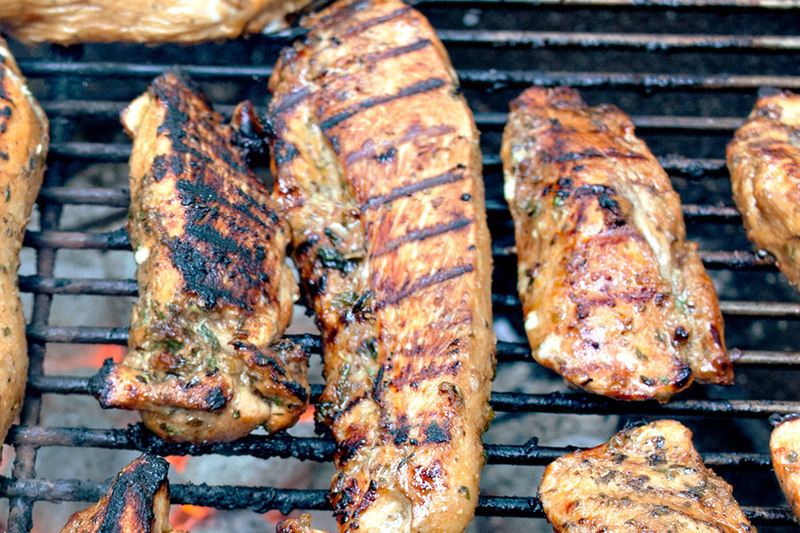 We’re getting geared up for the grilling season this year, so check back! Wonderful recipe! Another option to get the crisp skin is instead of putting the wings over direct heat, just flash fry them in a deep oil fryer for about half a minute. Finish with a sprinkling of the rub afterward. Still has the smoke, color and the spiciness. What kind of wood do you use in this recipe? Jim, I used a 50/50 mix of pecan wood and hickory. 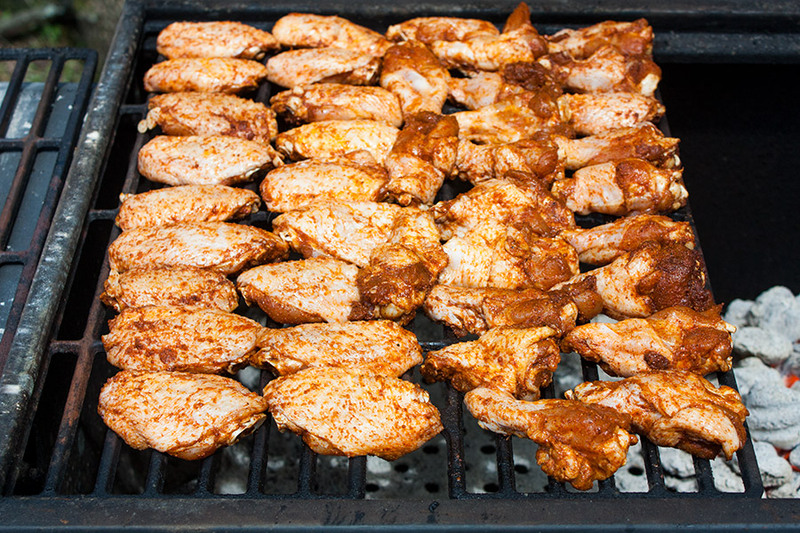 Do you use a water pan in the smoker for the wings when using the smoker or grill? I know some people that do, Mark. I, personally, do not. Wings cook so quick a water pan isn’t really necessary. They won’t dry out unless you over cook them. Awesome recipe, Smoked them with pecan wood in the offset smoker. I brought some to work everyone loved them! Great recipe but the skin turned out tough . Any suggestions on what I did wrong. I think maybe I didn’t grill over coals long enough. The smoking on the wings WILL give the skin a bit more of a ‘chew’ than just straight up grilling or frying. You definitely want to finish them off over the hot coals will as this will crisp up the skin, making it much easier to bite through. I think your observations are correct, a bit more time over that direct heat is the perfect fix. Smoked these with mesquite (all I had) and they turned out amazing! 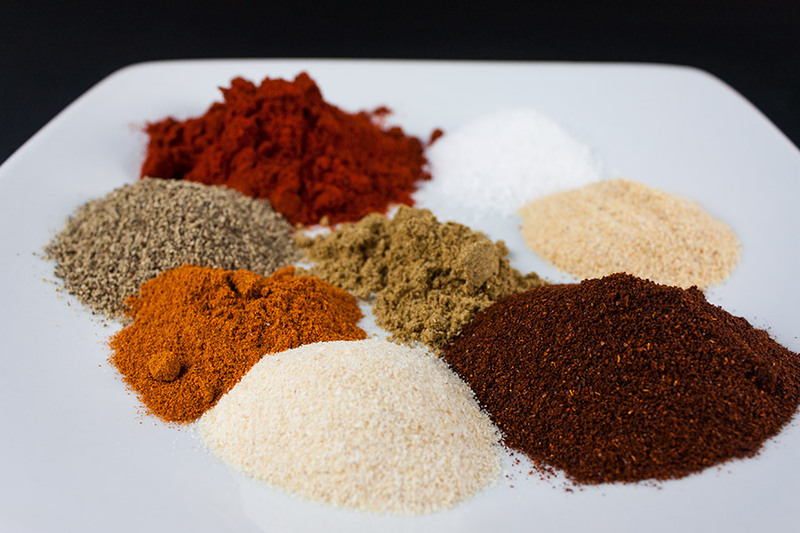 Wonderful combination of spices in the rub. I made these today. I added some honey. They were great. Thanks! 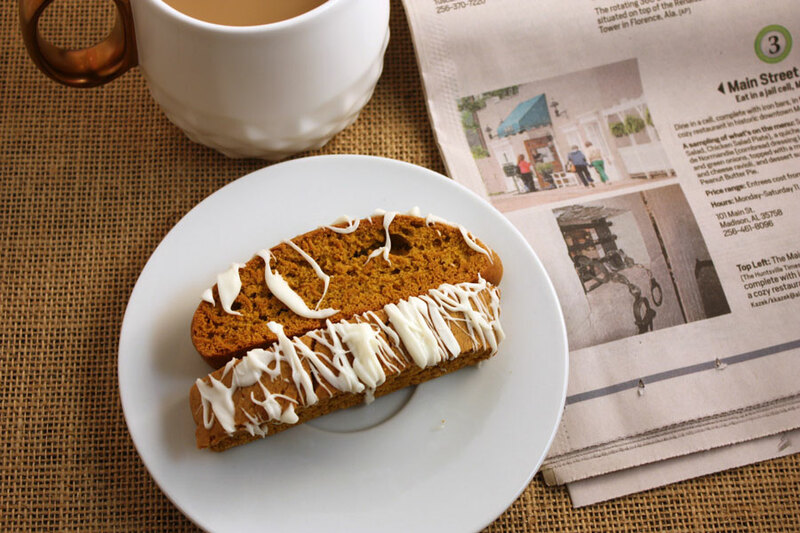 Just wanted to send a thank you for sharing this recipe! Just made a batch of wings for my wife and I, fifty of them to be precise, and only have fifteen leftover for lunch tomorrow!!!! Could not stop enjoying them! Hey, Tony! Thank you so much for coming by to let us know you enjoyed the wings!!! I just finished eating. i made these wings, some polish sausage, and a few whiskey Chuck burgers. Everything was excellent but these wings stole the show. Make the recipe as is, don’t change a thing. You taste buds will be doing somersaults! Glad to hear it, Tom. Whiskey Chuck burgers??? Tell me more! I just wanted to say that a great way to “crisp” up your wings is to line a cooking sheet with foil and put a wire rack on It. Set your oven to broil. Then put your wings on the wire rack and put into oven for about 2-3 mins each side of wing. It makes for a crispy smoky wing. I’ve been doing something similar to what you do for about 10 years but I made one change that really helped the wings. It was to marinade them in something like a Goya product (i.e. Mojo) overnight in the fridge. What it does is keeps them from from being temperamental when it comes to drying out. You don’t have to watch them like a hawk as even if the temp is a bit high and you crisp them up a bit over the coals (which is easy to overdo), you get really moist meat. It is a great thing to do if you need to reheat them when you make a bunch and then go to a party. That’s a great idea and I think I am going to try that next time! Thanks for the tip! My first time smoking wings and this was so easy and AMAZING!! I have a charcoal grill and placed the wings opposite the coals for indirect heat. I used mesquite chips that I already had and tossed them onto the coals dry. I smoked them for a couple hours and Shazam! Awesome, Tony! Glad you liked them. Did you try them with the Alabama White BBQ sauce or just on their own? Both ways work! Wings came out perfect on my Kamado. Used exact seasoning, then tossed them in some lemon pepper after they were complete. 10/10! Have you smoked and then fried wings to all of that crisp? I’m going to try that but wondering if I should not rub them until after they come out of the fryer. Hmm .. not sure, Dave. Only one way to find out! Let us know if you do it and what you found out. Wow what a delicious recipe! Thank you so much for sharing this recipe, I will must try to home. Excellent recipe. Added a little brown sugar and did 3lbs on a pellet smoker. Made these for a party last night. They were awesome! Everyone loved them and the Alabama BBQ Sauce is great with them! I have a new electric smoker and this was my first time using it. The pecan wood chips and rub worked so well together. Very good! Holy cats, this one is pure gold. Thank you so much for posting this, the family loved it! That’s so awesome to hear. Thanks, Chase! That chicken wings look absolutely awesome! Love the flavor combinations! Another way to get them crispy is to use an air fryer after they’ve been smoked. Can brown sugar be put into the mix? I’m thinking it might cut the heat just a little? I don’t see why not, Mark. If you’re concerned over the heat, just reduce the cayenne. But adding brown sugar sounds good, especially if you like the spicy-sweet combo. For my taste, rub calls for way too much black pepper and not enough salt. Also, item three of instructions should say to combine spice AND olive oil. Will adjust to our palate and try again. Thanks for the recipe. Thanks for pointing out the instruction faux-pas. We have fixed it. Fantastic recipe! My friends wanted crispier skin, so I smoked them at 225 for 2 hours and then put them in the oven (uncovered) for 15 minutes @450. They came out PERFECT.